TFW when you’re confronted with the idea of having to sit in a theater for 3 goddamn hours to watch the Avengers take down Thanos (presumably). Early rumors tease that the fifth Mad Max might finally be getting started. An Olympian joins the cast of American Horror Story’s ninth season. Boom Studio’s Talent might be coming to TV. Plus, new pictures from The Walking Dead’s return, meet the heroes of Doom Patrol, and say hello to Birds of Prey’s Black Canary. Spoilers, assemble! 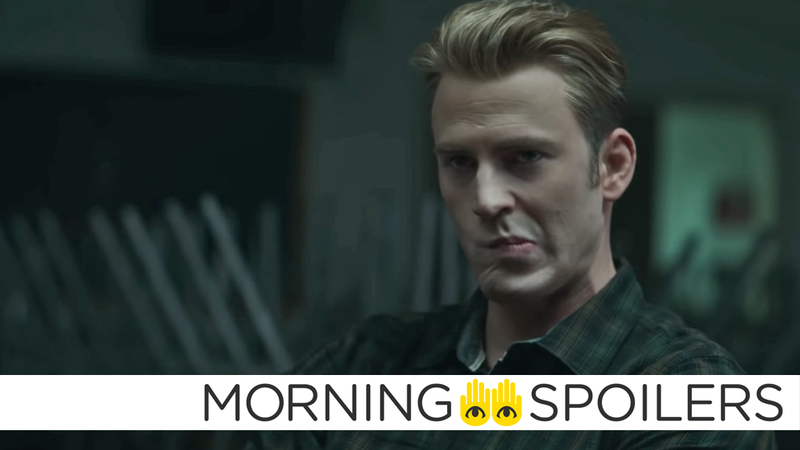 Hold on to your butts: Coming Soon’s Alan Cerny alleges that Marvel is considering an including an intermission in Avengers: Endgame...because the currently-being-tested cut of the film is three hours long. THR reports Imogen Poots plays the woman Nicolas Cage travels to the underworld to rescue in Sion Sono’s English-language action-horror film, Prisoners of the Ghostland. A fifth Mad Max movie is apparently potentially beginning to “rev its engines,” according to Fandango’s Erik Davis. THR reports Nick Jonas will also reprise his role as the marooned pilot Alex in the upcoming Jumanji sequel. According to Collider, Scott Teems has been hired to write Blumhouse’s Halloween 2. /Film reports Netflix has acquired the distribution rights to I Am Mother, the sci-fi indie currently playing Sundance starring Rose Byrne as a subterranean robot raising children underground. Captain Marvel has been rated PG-13 by the MPAA. Prepare yourselves accordingly. Monster Hunter is now slated for a September 4, 2020 release date, according to Deadline. Two new set photos of Jurnee Smollett-Bell as Black Canary have surfaced. Lupita Nyong’o becomes a Persona protagonist in a new poster released by Jordan Peele. James Cameron hypes the spectacle of Alita: Battle Angel in a new featurette. Emma Roberts and, err, Olympic gold medallist Gus Kenworthy have joined the cast of season nine, according to Ryan Murphy on Instagram. According to The Wrap, Fox has given a “script plus significant penalty commitment” to an hour-long drama from Graham Yost based on the Boom! Comics series, Talent. The series concerns the sole survivor of a plane crash who mysteriously acquires the talents and abilities of the disaster’s 148 fatalities. The Prince of Darkness rises (a bit too high) in the latest TV spot. A new poster from Comic Book assembles the full cast. Skybound has also released four new character portraits for the second half of The Walking Dead’s ninth season.